Low warp tapestry, wool, metallized polyester, 3,20 m x 3,20 m.
Leading to a reflection over the definition of the object’s place within the industry and the field of art, Mathieu Mercier’s work, Marcel Duchamp Prize 2003, characterize by a permanent questioning over the symbolic and utilitarian functions of the objects. His productions demonstrate an unabashed behavior towards casual objects in a radical approach liberating the object, unique or serial, of every acquired knowledge. Mathieu Mercier’s work, primed during the second edition of the Cité’s call for contemporary creation, builds itself around a game of a “two-way trip” between the material and the motive. From far away, the viewer only recognizes a textile motive, from which he does not succeed in determining in which way it is done. As much as one gets closer to the tapestry, the motive gets blurry, there is only a number of pixels to be seen but one succeeds in perceiving the textile material of the work. The tapestry then composes and decomposes itself, following in the realized movement to give “the illusion of a realistic representation remotely to become geometrical from a closer angle”, according to the artist’s words. For the realization of its work in tapestry, Mathieu Mercier indicated his wish to obtain the flattest tapestry possible, in window dressing, breaking the imitation effect of the represented object, which could have been expected in such a project. Furthermore, the chromatic scale is tightened to seven colors. 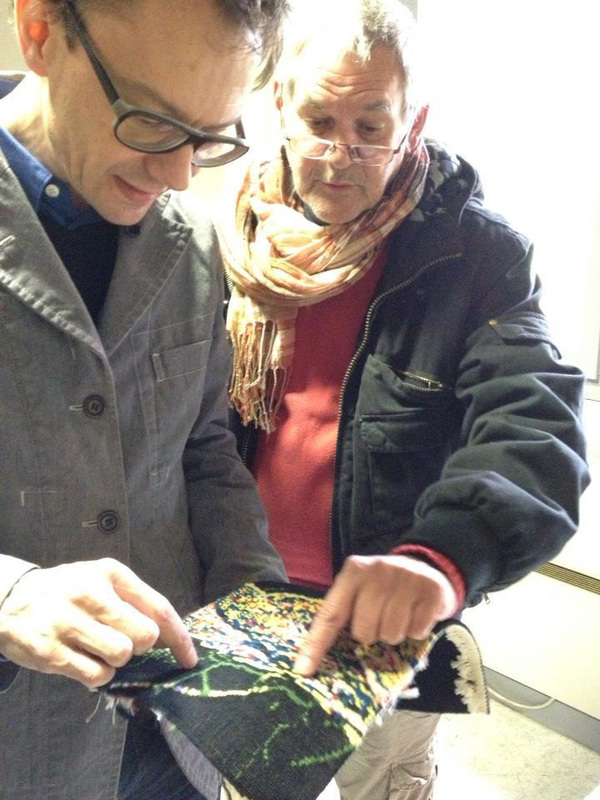 With this work, Mathieu Mercier is interested in the settlement of mini-tapestries realized from a fragment of the rope. This work of Mathieu Mercier’s is within the scope of a series of works realized by other people (craftsman etc.). 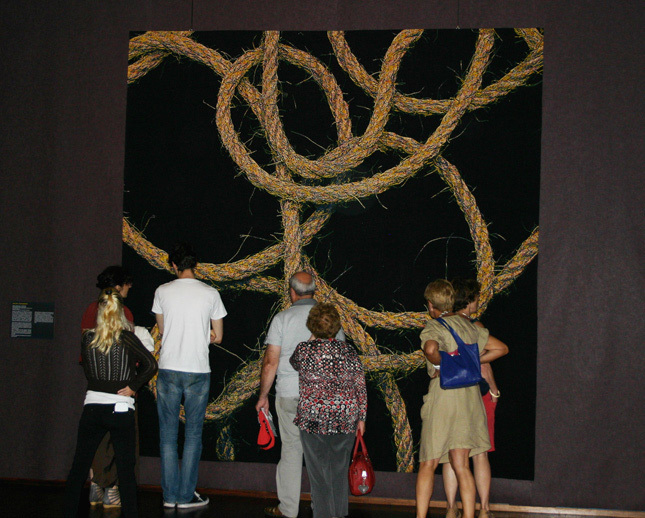 The weaving of this massive rope of 3,20 m x 3,20 m, realized by the weavers Daniel Bayle and Agnès-Marie Durieux for the workshop Pascal Legoueix, has been set free from the loom on the 6th, June 2014. Mathieu Mercier has graduated from the École Nationale des Beaux-Arts in Bourges and the Institut des Hautes Études en Arts Plastiques in Paris. In 2003, he won the Marcel Duchamp Prize. In 2007, his whole work is exposed at the Modern Art Museum of the Ville de Paris. He is represented by the galleries Mehdi Chouakri (Berlin), Massimo Minini (Brescia, Italy), Lange & Pult (Switzerland) and Ignacio Liprandi (Buenos Aires, Argentina).